Kansas City, Mo. 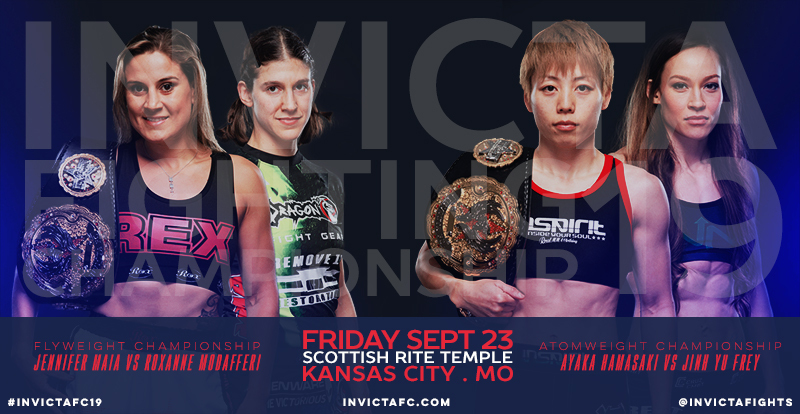 – Invicta Fighting Championships today announced the eight-fight card for Invicta FC 19, the organization’s return to Scottish Rite Temple – the nationally recognized historic landmark – in Kansas City, Mo. on Friday, Sept. 23. Six additional bouts join the previously announced flyweight and atomweight title fights at Invicta FC 19, which streams live and exclusively on UFC Fight Pass. Pulled from Invicta FC 18 after her opponent was forced off the card, Mexico’s Irene Aldana (5-2) returns to the Invicta cage for a bantamweight brawl with Faith “The Immortal” Van Duin (6-2) of New Zealand, who drops down after previously competing for Invicta’s featherweight championship. Muay Thai champion Tiffany “Time Bomb” Van Soest makes her professional mixed martial arts debut. Van Soest’s opponent will be announced shortly. Indian prospect Manjit Kolekar (8-0) puts an unblemished record on the line in her promotional debut against Brazilian veteran Kaline “The Dark Angel” Medeiros (7-4), who enters the bout on a four-fight winning streak. Sunna “Tsunami” Davidsdottir, a member of Iceland’s Mjölnir MMA gym, also enters her first professional bout, taking on Ashley “Doll Face” Greenway (1-0). Plus, undefeated atomweight Julia “Jewels” Jones (4-0) meets Stephanie “The Scrapper” Skinner (4-5) while Amber Leibrock (1-1) and Amy “Donkey Kong” Coleman (2-0) square off at featherweight. Invicta FC 19 is headlined by newly crowned interim flyweight champion Jennifer Maia (13-4-1) putting her belt on the line against challenger Roxanne “The Happy Warrior” Modafferi (19-12). In the co-main event, Japanese star Ayaka Hamaski (13-1) defends her atomweight championship against surging Jinh Yu Frey (5-1). Tickets for Invicta FC 19 go on sale tomorrow, Saturday, Aug. 27 at 10 a.m. CT and will be available for $75, $50, and $35 at Ticketfly.com.